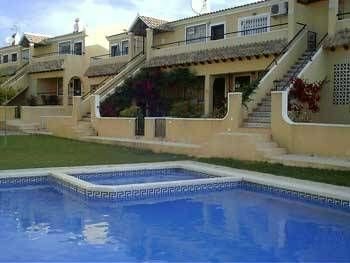 GROUND FLOOR APARTMENT , NEXT TO POOL AND CLOSE TO ALL AMENITIES FOR A ENJOYABLE HOLIDAY . THE GROUND FLOOR APARTMENT IS FULLY FITTED AND FURNISHED , WITH FANS IN ALL ROOMS . THE APARTMENT HAS ONE DOUBLE , ONE TWIN AND A LARGE SOFA-BED IN THE LOUNGE TO CATER FOR ALL PARTY SIZES . THERE ARE FRONT AND REAR GARDENS , WITH A TERRACE AND GARDEN FURNITURE , MAKING THIS IDEAL FOR SUNBATHERS . WITH THE POOL DIRECTLY OUTSIDE THE GARDEN , THIS MAKES THIS IDEAL FOR FAMILIES . THE LOCAL PUB IS A FIVE MINUTE WALK , HORSE RIDING IS AT THE END OF THE STREET , THE PLAZA CONTAINING OVER TWENTY PUBS , RESTAURANTS AND SHOPS IS ONLY 10-15 MINUTE WALK AWAY . WITH A CAR THE BEACH IS 10 MINS ,WATERPARK 15 MINS , GO-KARTS 10 MINS AND THE GOLF COURSE 5 MINS DRIVE AWAY . IF FEELING A LITTLE MORE ADVENTUROUS , BENIDORM AND TERRA-MITICA ARE ONLY 60-90 MINS AWAY . WITH ALL THE DIFFERENT AMENITIES AT HAND , THE APARTMENT AND ITS LOCATION IS IDEAL FOR FAMILIES , COUPLES AND GROUPS WHO CAN HAVE A QUIET OR ACTIVE HOLIDAY . THE APARTMENT HAS BEING FULLY DECORATED THROUGHOUT AND THE ELECTRICAL SUPPLY HAS BEING UPGRADED . MANY NEW APPLIANCES HAVE BEING PUT INTO THE KITCHEN , A NEW QUEEN SIZE BED PUT INTO THE BEDROOM AND A NEW TELEVISION , ARMCHAIR , A LARGE SOFA-BED , ETC HAVE BEING INSTALLED INTO THE LIVING ROOM TO ACOMMODATE A TOTAL OF SIX PEOPLE . THE GARDENS HAVE BEING FULLY RENOVATED AND HAVE GARDEN FURNITURE PROVIDED . THE APARTMENT HAS AN AIRCON / HEATING SYSTEM INSTALLED TO MAKE IT ALL YEAR ROUND ACCOMMODATION.